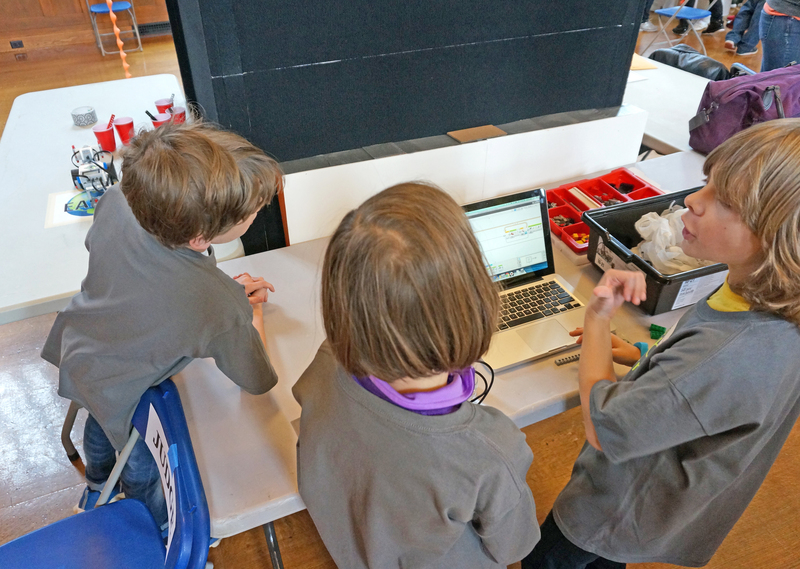 Three third and fourth grade students from the Kennedy-Longfellow School spent a Saturday in early June participating in the Boston Public Schools (BPS) Robotics Olympics. Not only were they amongst the youngest students there, they were also honored to be the only team representing the Cambridge Public Schools. Based on year’s theme, “Unchartered Territory: Explorers and Pioneers”, the team of three chose to create a robotic rover to compete in the “Space Exploration” challenge. The robot (which had to fit within the size of an 8.5×11″ piece of paper) was tasked with carrying various space equipment (Lego pieces) from earth (a white sheet of paper) and dropping them into the space station (a roll of duct tape). Before the competition, the team undertook an organic engineering design process – beginning with brainstorming an initial model that had some serious structural integrity issues. 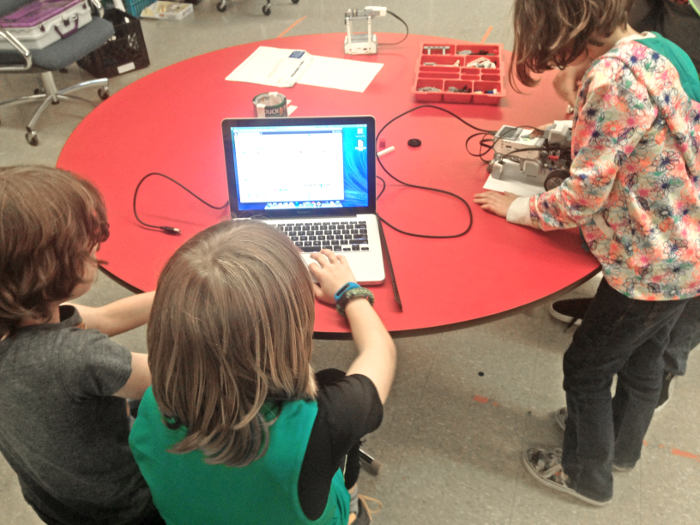 After several iterations, their rover was structurally sound enough to begin programming using the Mindstorm software. They quickly realized, however, that the structure had to be reworked many times as they endeavored to make successful missions between earth and the space station. Touch and light sensors were added and also adjusted numerous times to tweak the robot’s performance. Finally, during the last minutes of the last practice runs, they reached several successful equipment deliveries and pride was beaming. 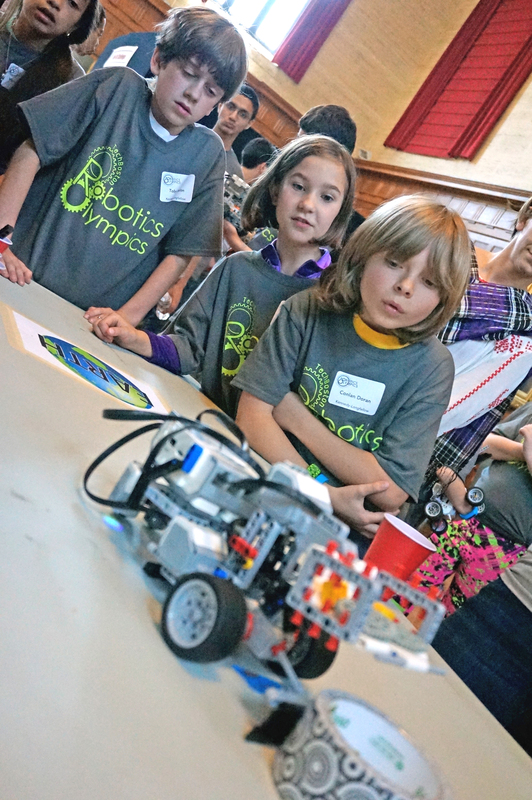 The scene at the Boston Robotics Olympics, held at Wentworth Institute of Technology, was bustling with BeeBot robots, Lego WeDo catapults, EV3 Iditerod sleds, mystery mazes, and more. Categories were spread throughout the day, and the team enjoyed a mix of viewing the other competitions and refining their design/program based on the actual course. Once their competition was underway, the different teams took turns running their missions. Adrenaline and excitement were high as the K-Lo rover made it’s passes, with only a few pieces of equipment falling outside the space station. 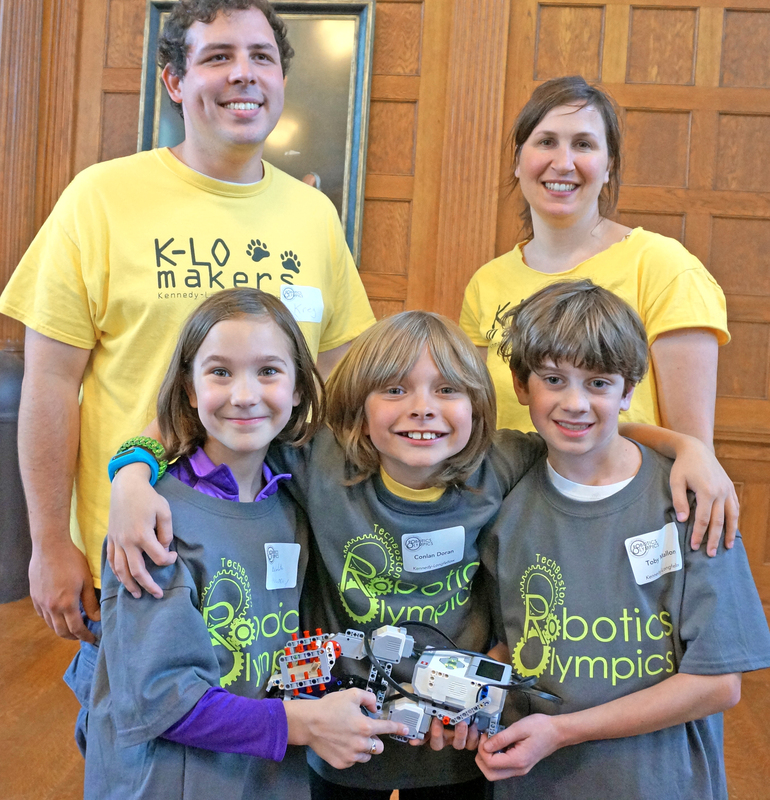 Overall, the K-Lo team scored 56 points out of a possible 100– an extraordinary achievement in collaboration, engineering, problem solving, and programming. Congratulations to these three extraordinary students! Catch us at Scratch Day @ MIT! Lesley STEAM will be volunteering at the event: come say hi and play: Saturday, May 11th, 2019.